Steps for Remodeling Your Bathroom | RenoWOW! Once you notice something in your bathroom that bothers you, it can be hard not to see it every time you come into the room. This thing, however big or small it may be, can lead you to want to remodel the entire room. If you’re settled on a complete renovation, here are our suggestions to help make the process run smoothly from start to finish. Plan the Layout – Consider the amount of space you have available in your bathroom when you’re determining how you want it to be laid out. A good place to start is by drawing an outline of your bathroom and experimenting with a variety of layouts. Think about the best option for your life but remember that having to move any plumbing will cost extra. Decide on a Style – Determine the style you want for the bathroom before you start the remodeling. For instance, you can choose to go with a vintage, industrial, black and white, or modern style. Once you know the style you want to use, start collecting ideas from contractor’s galleries and websites such as Pinterest. Gather ideas for the overall bathroom, colours, cabinets, taps, bath, handles, and fixtures. You may find one thing that you fall in love with that helps make the rest of your styling choices easier. Choose Your Finishes – There are a wide variety of finishes you can choose for your bathroom. For the walls, you can select paint, tile, wood, stone, and wallpaper, or a combination of any of these. Along with tile flooring, there is also the option for stone, wood, linoleum, and vinyl. Counters and vanities can make use of tile, stone, laminate, and solid surfacing. Depending on your overall style, you can decide which finished will suit the theme of the room best. Select Your Tiles – If choosing to use tile, it is advised to select your tiling once you’ve decided what is going to be the ‘wow’ factor in your bathroom. If you don’t have a large feature like the bath that will draw the eye, then you can opt for a more detailed tile. You can also choose to go with a mosaic tile pattern as a feature while leaving the rest of the tiles neutral, so they don’t compete. Also remember that you don’t need to place tile up the walls in the bathroom if you don’t want to and can decide to do a half-tile with a complimentary paint colour, or no tile at all. Pick Bathroom Fixtures – When choosing your tub, sink, faucets, and toilet, keep cost, style, and water conservation in mind. Be sure they match your design, but also keep in mind the potential for water savings. Most modern toilets are low-flush, meaning they use much less water than traditional toilets adding up to long-term water savings. Monitor Your Budget – Everything you select adds up. While it might seem like a small purchase here and there, over time, it can have a significant cost. Creating a spreadsheet to monitor the overall expenses and keep track of any unexpected spending is recommended. Always leave a little bit of extra room in your budget, as it’s better to come in under budget than over. Stay Organized – Having your plan determined before remodeling starts is essential. It’s crucial to have made all of your selections well in advance so that when the time comes for installation, the contractor doesn’t have to find you to make decisions only to find that selection is unavailable or won’t be in stock for months. The kitchen and bathroom are the most used rooms in your home, and you don’t want to have mediocre aspects because you had to make rushed decisions. 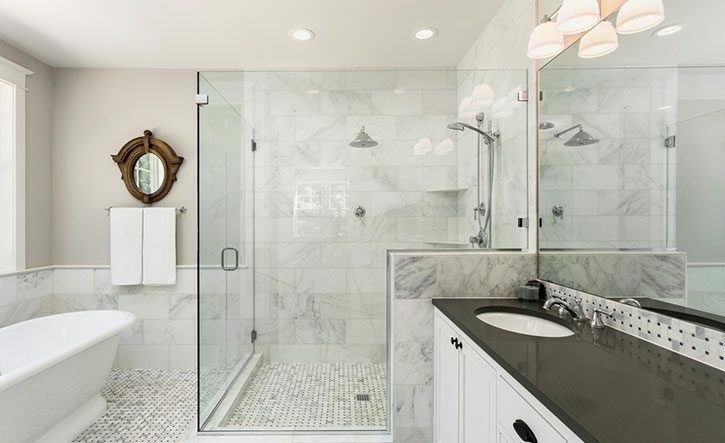 When it comes time to have your bathroom redone, our skilled team of professionals can be trusted to have your custom renovation project done on time and the right way. Call renoWOW! 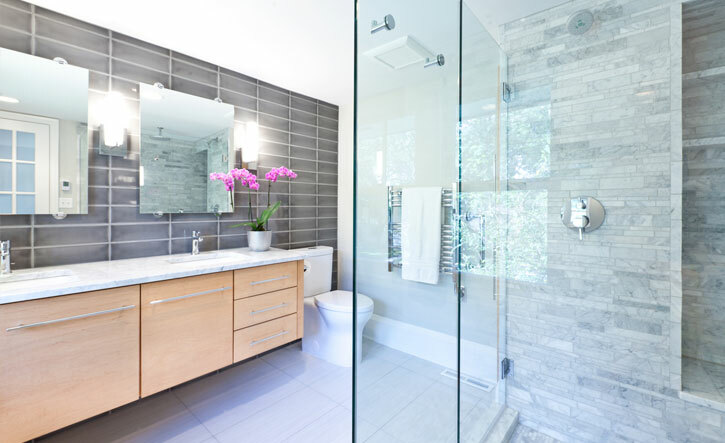 at 416-937-0969 or contact us for information about bathroom renovations in Toronto. We are also available to provide free in-home consultations or estimates for your next home renovation project.